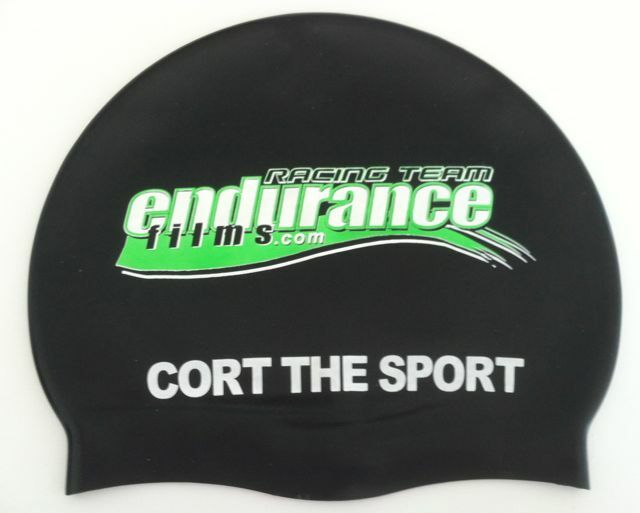 Cort the Sport: A week of 'firsts'...including a biggie! First indoor swim. I'm back at the Blacksburg Aquatic Center with the early morning gang, and I enjoyed a first swim in my new swim cap!! The caps were organized by my Endurance Films teammate, Bill. First ride on the bike trainer. This took place the morning prior to our 340 mile drive to the beach. 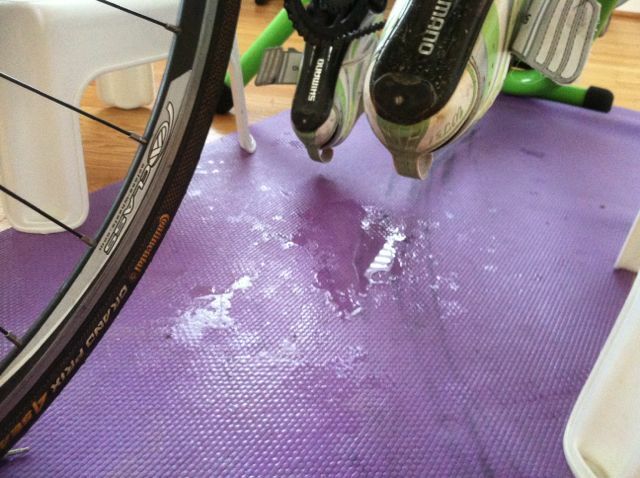 I'd forgotten what a puddle-making mess I am on that thing. I soaked completely through my towel and onto the mat. Yuck. First early morning run with gloves. It was in the upper 40's which is perfect for a tank top and shorts...annnnd gloves. My hands are the one thing that get cold. These are my original beloved running gloves that I have had for four years. First announcement of my NEW JOB!!!!! YES!!! New job!! 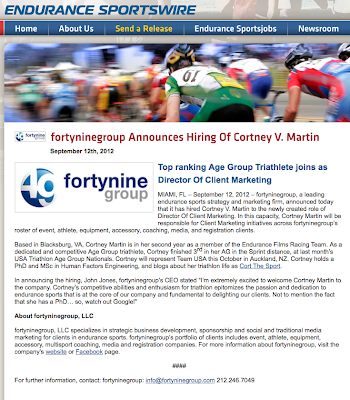 I am the new Director of Client Marketing for the fortyninegroup, an endurance sports strategy and marketing firm. 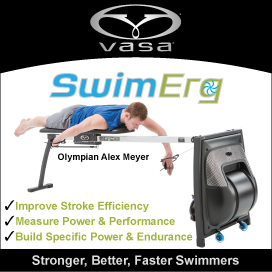 I work with event, athlete, equipment, accessory, coaching, media, and registration clients primarily in triathlon! I could not have dreamed up a better opportunity. The CEO, John Jones, is an accomplished endurance athlete in his own right, and I have been delighted to work for him and with the athletes, coaches, and innovators in endurance sports. In my marketing role, I have the opportunity to write, think creatively, organize, wrangle, help, strategize, and communicate. I'm also learning a lot. I could go on and on about my excitement and how I love to get up every day and get to it, but I will wrap up simply by saying, follow your passions, you never know where they may lead.